What's a boys trip without facial hair? This Spring, my friend Chris approached me about doing a week long backpacking trip to Isle Royale National Park. Isle Royale is Michigan's only national park and is located in Lake Superior, north of the Upper Peninsula. 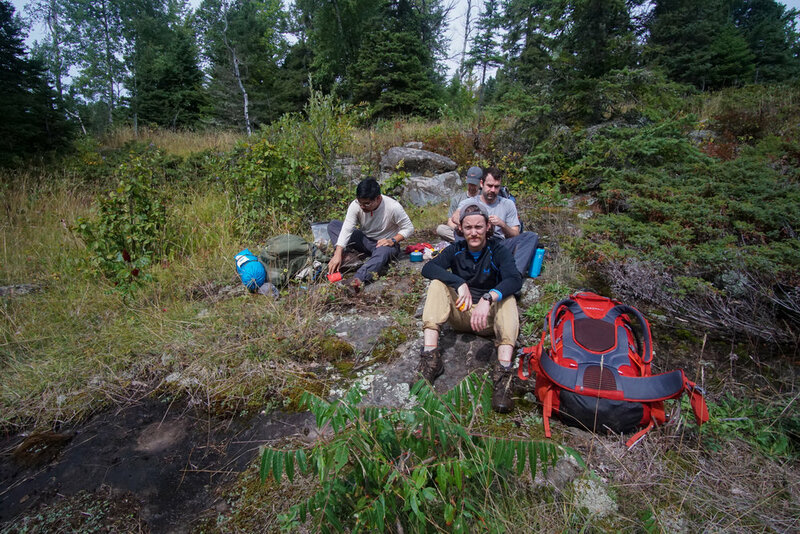 I didn't even know about its existence until a few years ago when my friends Stephen and Kolin went on a trip there (a trip that inspired Kolin to start an outdoor gear company called Isle Box - check them out and Kolin's post on his trip to Isle Royale). To be honest, I'd also never even been to the U.P. I was sort of embarrassed by these facts. So, as a Michigander with an agenda for visiting national parks over the next year, I didn't hesitate to commit to the trip with Chris. It felt like destiny to start in my home state, kicking off my year of outdoor exploration with some of my best friends: Along with Chris and myself, our fellow friends Albert, Colin, and Greg were coming along for our 5 nights/6 days on the island. Mustaches and all! 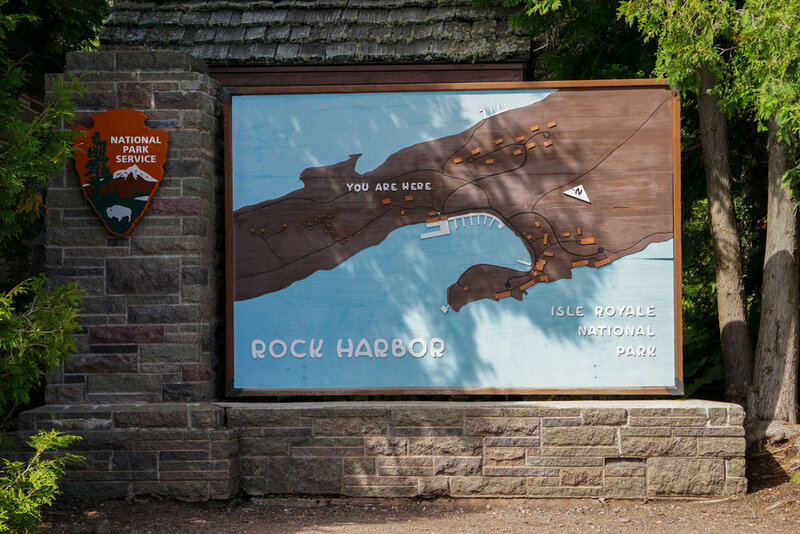 Nestled in Lake Superior close to the Minnesota and Canada borders, Isle Royale became a National Park in 1940, largely in part through the efforts of Albert Stoll, Jr. who was the "Conservation Editor" at the Detroit News from 1923-1950. Stoll fought tirelessly with others to protect Isle Royale after he became concerned about the over commercialization of its shores by vacationers. But he wasn't the only person who saw the amazing wilderness qualities that needed to be protected on the island. In 1981, the United Nations declared Isle Royale part of the International Network of Biosphere Reserves. After visiting Isle Royale myself, I understand the efforts of people who want to protect the island. The landscape and plant life change dramatically throughout the island due to its tilted rock layers. In one part of the island you may hike through pine and birch forests similar to the Pacific Northwest, then an hour later find yourself among giant leafy plants and other fauna similar to a rain forest. The peaks, valleys, and bodies of water formed by these tilted rock layers, surfacing in the middle of an ocean-sized lake, create a secluded and peaceful retreat into a raw, natural habitat. As a secluded island with limited access (you can't even begin talking about getting there without first getting to remote parts of Michigan or Minnesota), it remains one of the least visited national parks. Getting there, you have two options: boat or sea plane. The boat is more reasonably priced, but you sacrifice time and potential motion sickness with this route. As a group of 5 people trying to keep costs low, we opted for the 3+ hour boat leaving from Copper Harbor, Michigan that arrives in Rock Harbor on the southeast side of Isle Royale. 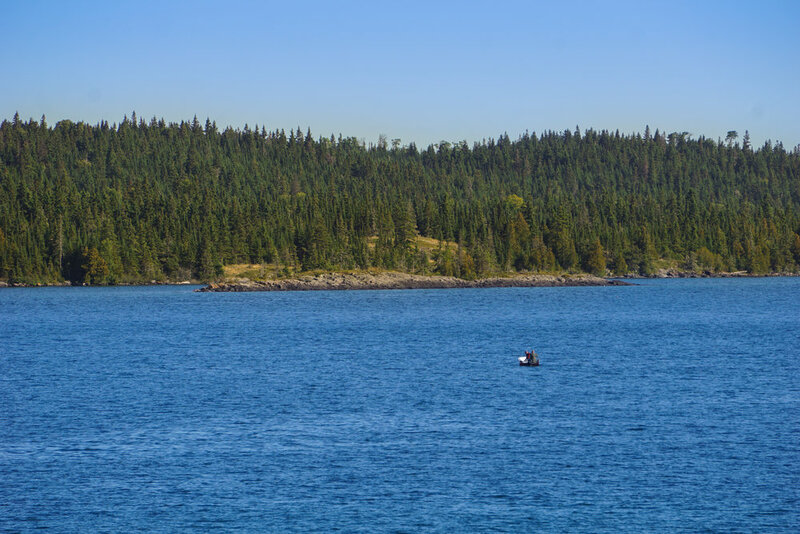 You can also take a longer boat from Houghton, MI to Rock Harbor or boats from Grand Portage, Minnesota that primarily go into Windigo, on the western part of Isle Royale. An overview with links to the various options is available on the National Parks website. The 5 of us met in Madison, WI at my apartment on Friday night, did a mini tour of Madison on Saturday before hitting the road for Copper Harbor, and on Sunday morning boarded the Isle Royale Queen IV. 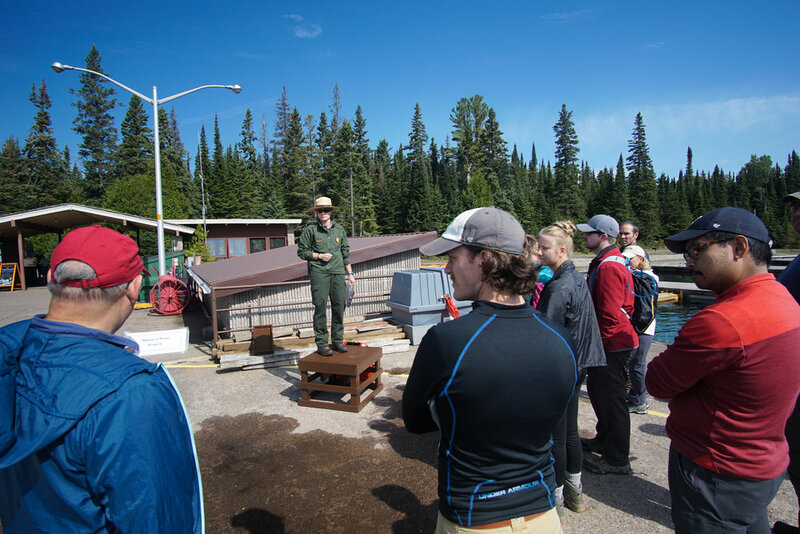 Upon arrival to the island, you're greeted by National Park Rangers who split you into a day/resort visitor group and an overnight backpacker group to go over principles of Leave No Trace and about different aspects of Isle Royale (such as notices of non-safe water, where there are shelters, building fires, etc.). Us: How's it going; where ya heading? Them: We're on our way to McCargoe. Us: McCargoe's great! We were there last night and jumped off the dock into the water, which was cold but refreshing. There's also a fire ring and we made a fire with a few other sites last night and shared whiskey. Them: Excellent! Where are you heading? Us: Moskey Basin tonight for us. Them: Oh yeah! We're coming from there. Most of the shelters are on exposed rock right on the water. It's awesome. Us: Sweet. Hopefully we can get one of those spots. Them: You shouldn't have a problem. It wasn't very full. Everyone: Well, see ya on the ferry on Friday! It was very common to cross paths with people who were trading places and the conversation almost always ended with the collective, "see you on the ferry on Friday." 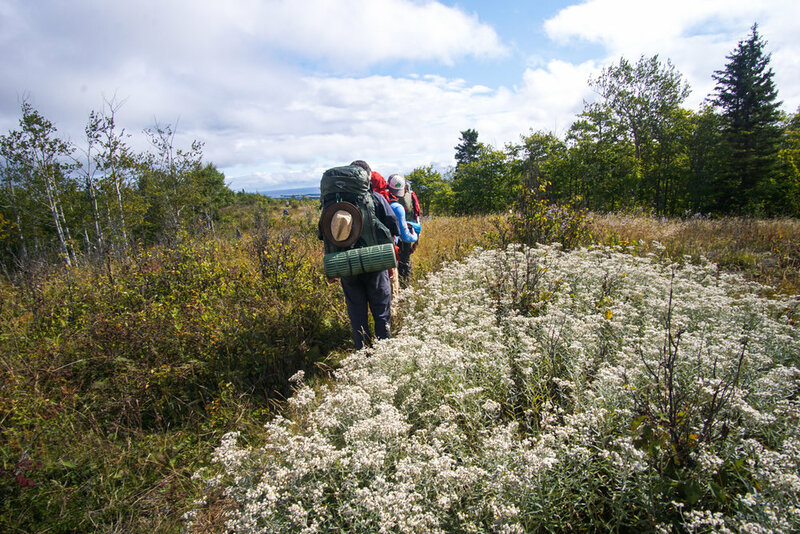 There was an inherent comradery to being on the island with others, where it felt like everyone had similar desires in coming to Isle Royale and sharing an experience of being in such a secluded, peaceful, and difficult place to reach. Everyone was friendly and ready to swap information, share stories (and whiskey), and get others excited about what they'd already seen on the island. One of the most common questions shared when crossing paths was about what wildlife may be ahead on the trail. Almost always, the implication behind this was whether or not you'd see a moose. Isle Royale boasts having an estimated 1,600 moose on the island, which has grown considerably in recent years. So there should be a good chance of seeing a moose while roaming the 893 square miles on the island. There used to be a better balance with predator wolves, but due to an inbred population and deaths from falling into mine shafts, there are now only 2 wolves remaining on Isle Royale. This is the hot topic for the island: do we introduce more wolves into the population? The National Park system is seriously considering it at this time, but hasn't made any commitments. Previously, wolves came over ice bridges that formed between Canada and Isle Royale. Scientists started keeping track of these ice bridges in 1973 and since then have seen a 30% decrease in ice build up during winter. Ice bridges might be as infrequent as every 15 years now, which doesn't leave as much opportunity for wolves to stumble across the 12 miles from Canada to Isle Royale. 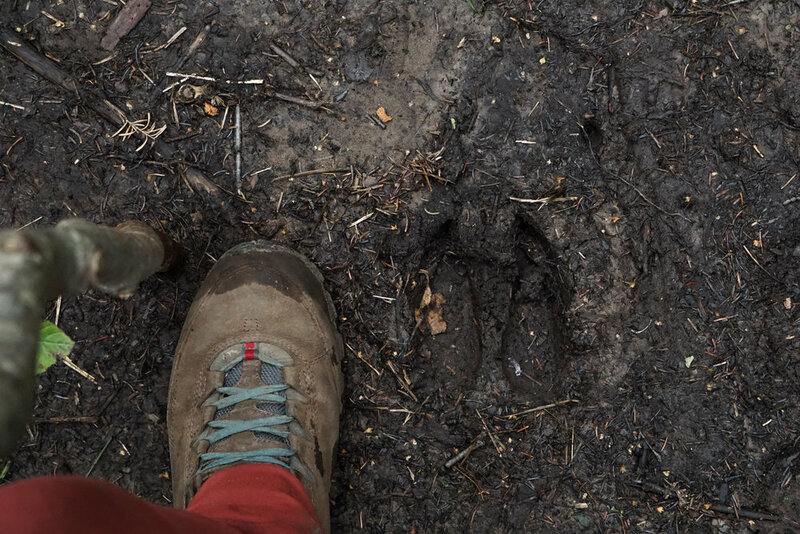 Surprisingly, for a population for 2 wolves spread out over a large island, we were lucky enough to see some pretty fresh prints in the mud as we hiked from Moskey Basin to Lane Cove on our 4th day. We also saw a moose within the first 15 minutes of hiking as we left Rock Harbor toward Daisy Farm. After seeing that moose we thought we'd see them every few hours, but unfortunately that was our first AND last time seeing a moose on the island. We kept our daily hikes from 8-10 miles so we could start in the morning as a reasonable hour and still get into camp before dinner with time to relax and enjoy the destination. Sometimes the moving was slow since Isle Royale had seen massive amounts of rain in the week leading up to our visit. The paths often felt like mud minefields, where we were forced to tread delicately and tip toe from patch to patch of safe dirt. Our hike to Daisy Farm on the first day passed these mud fields, but also went along much of the coast, offering beautiful views. We stopped for a classic PB&J lunch at one rock clearing and looked out over the water, watching the small boat shuttles occasionally pass by with passengers looking to be dropped off at other campground docks to begin their trips. Once we arrived at Daisy Farm, we snagged a spot in a shelter, which we were very grateful for during the rainy night. For how secluded it is, Isle Royale is unique in offering 6-person wooden shelters at many of their campgrounds. The only point for us where it was tents-only was at Lane Cove (we also used tents at the Rock Harbor campground). Once we were settled, we went down to the water with our filters, boiled it, and made some of delicious freeze dried beans and rice. Water sources on Isle Royale are frequent enough, but require significant filtration or boiling. If you're visiting Isle Royale and need potable water, you need a .4 micron filter or need to boil the water for a minimum of 1 minute. Chris and I both had Katadyn Hiker Pro microfiltration systems and could make quick work of filling up our bottles and hydration systems whenever we needed it. The next morning we set out for McCargoe Cove. 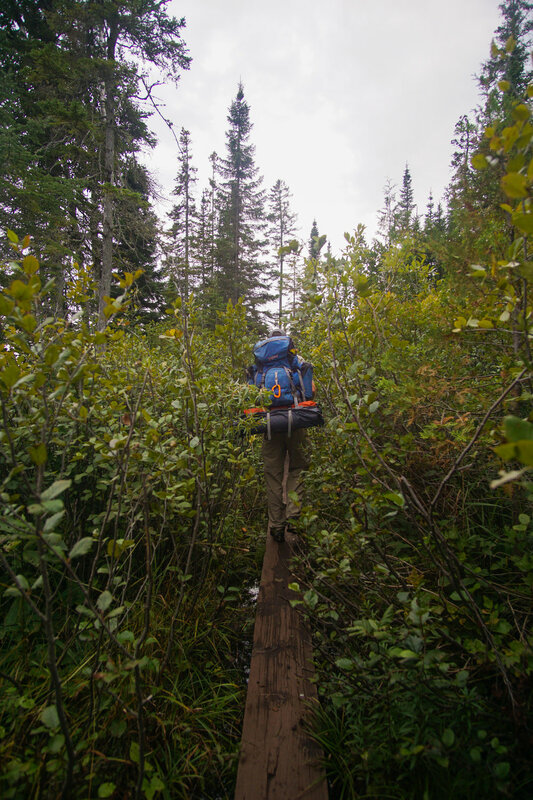 The trail passed through forests in the center of the island, opening up at various points to swampy areas, ponds, and lakes where beautiful flowers popped up next to the wood boardwalks erected by Park Rangers, helping to keep feet dry. Passing over the middle of the island, we had to higher altitudes to cover, which offered beautiful views of the surrounding areas and the island stretching out from east to west. And in one part, the mud on the trail was so bad that an unofficial path through the brush was formed, passing through birch trees and tall ferns that lit up warmly as the sun passed in and out of the clouds. At McCargoe Cove we settled into a shelter and took advantage of the sun peaking out of the clouds. We went down to the dock at the cove and sat on the edge, throwing our feet into the cold waters. Lake Superior water temperature in September was probably in the mid 50s, but sitting in the sun with a weary body, that water looked awfully tempting as a quick refresher. A few years ago my family vacationed in Maine and my mom really wanted to go in the water - I was the only one to brave the mid 50s water with her. I figured if I could do it then, I could do it now and slowly worked my mind over on jumping off the edge of the dock. Eventually I did the necessary mental convincing, and it didn't take long for others to follow suit, including a group of fellow hikers we befriended due to our parallel path over the first few days. The cold water was like shock therapy, rejuvenating the body, and everyone felt renewed. As the sun went down and the full, bright moon rose, we retired to our shelter to prepare our freeze dried chicken and rice dinner. After dinner we went back down to the water to build a fire and share whiskey with other campers. There are only a couple of locations in Isle Royale with fire rings and are all communal. Elsewhere on the island you're not allowed to build fires. The next day we got a later start (our whiskey was depleted) for our hike to Moskey Basin. The hike was one of my favorites as it passed by a few lakes, winding through pine tree forests with large, leafy plants. This was the hike that reminded me most of areas like the pacific northwest. At Moskey, we hung out for a while chatting and enjoying the view of the water from our new backyard before it started raining. During the rain we went in our shelter and pulled out Code Names for the next few hours, snacking on Greg's custom trail mix that has the perfect amount of chocolate to nut ratio. Eventually we were ready for dinner and amidst the drizzling rain boiled water for freeze dried 3 cheese pasta. It stopped raining as we ate, so we went back to the waterline and watched a family of ducks wander about as the sun set beyond the tree line on the opposite side of the basin. The next day we departed for Lane Cove and thanks to the fresh rain followed a muddy path. Thanks to that mud, this is where we followed fresh wolf prints for over a mile. In the central section of the hike we had the largest ascent of the trip, which was only around 400 feet of incline, to the peak of Ojibwa Mountain. 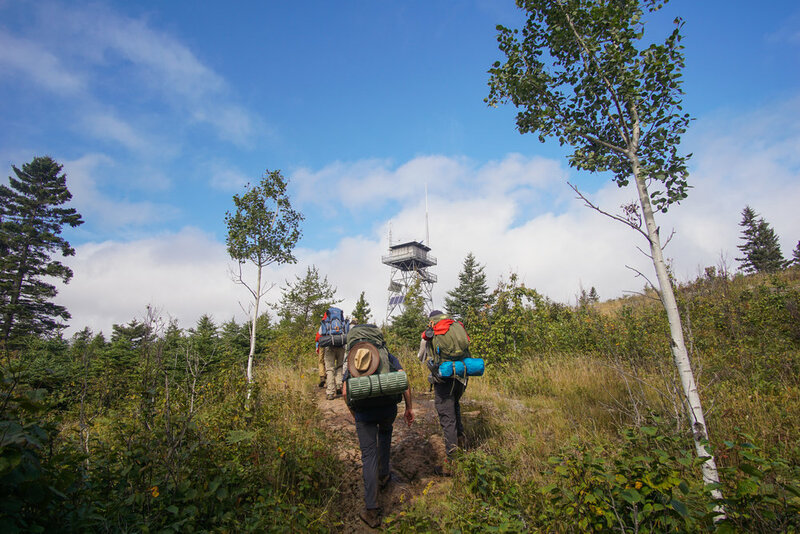 Ojibway Mountain has a weather observatory structure at the peak where you can climb stairs to get a better view of the surrounding area. This was the best place for seeing the breadth of the island and you could even look north and see Thunder Bay in Canada. From Ojibwa we hiked east along the ridge for several miles to the peak of Franklin Mountain before beginning our descent into Lane Cove. The hike along the ridge competed for my favorite hike, with various earthy tones of brush, flowers, tall grass, and trees that would delicately catch the light from the sun. They would illuminate in a gradient fashion, slowly blending into the rock surface beneath. It was a place where simple colors just seemed to pop. Further below Franklin Mountain we also came across the works of the local lumber union (beavers), seeing the impact they had on small ponds and their current efforts in bringing down new trees. 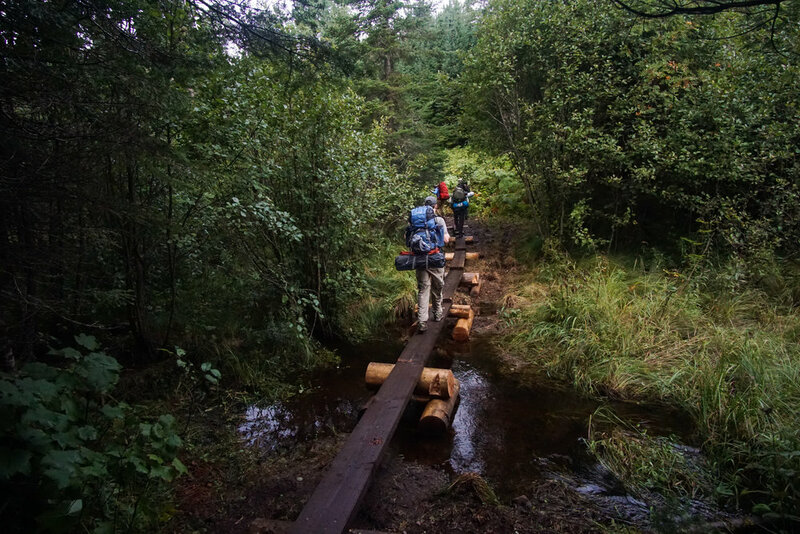 During this section of the hike we passed over new sections of wood boardwalk the rangers were working on, necessary due to the growing bodies of water around the beavers' dams. Playing Code Names with a fellow Billiken! At Lane Cove all the campsites were taken, so we borrowed space from a couple. It was a puzzle figuring out how to fit 3 extra tents in a space probably meant for 1, but we eventually made it work… so long as you didn't roll in your sleep, which meant hitting the person in the tent next to you. With our new neighbors, we settled in for a few games of Code Names before dinner. During the course of the game we learned that Kris, the woman in the couple, was a graduate of Saint Louis University where all 5 of us went to undergrad. So that was a fun connection to make before separating for a dinner of freeze dried beef chili mac. I believe I eat tastier food when camping than when I have a full kitchen at my disposal - freeze dried food has come a long way over the years. The next morning we packed up our tents and began our last major hike back to Rock Harbor. This was the easiest hike, beside the first 2 miles which were a steep up hill climb. Albert was in the zone, setting a pace uphill that most of us couldn't keep but were too proud to say anything about. Once we hit the apex of the climb, it was mostly downhill and flat paths to Rock Harbor, passing by several coves and the northern shoreline of the island. At Rock Harbor the shelters were all taken, so we settled into a tent site and then went to the general store for some celebratory beers. We chose the Keweenaw Brewing Company's "Hefé Royale" ale and sat around our picnic table playing more Code Names before making our lasagna with meat sauce dinner. Freeze dried. After dinner we walked down to the harbor to look over the breakfast menu at the restaurant. We were sold after seeing cinnamon rolls and large breakfast burritos. Greg had to use the bathroom before going back to our campsite, but Chris went back while the rest of us waited. That ended up being a secret salvation, for as we walked back and were nearly out of the open harbor, Colin pointed up in the sky and commented on how weird the clouds looked. 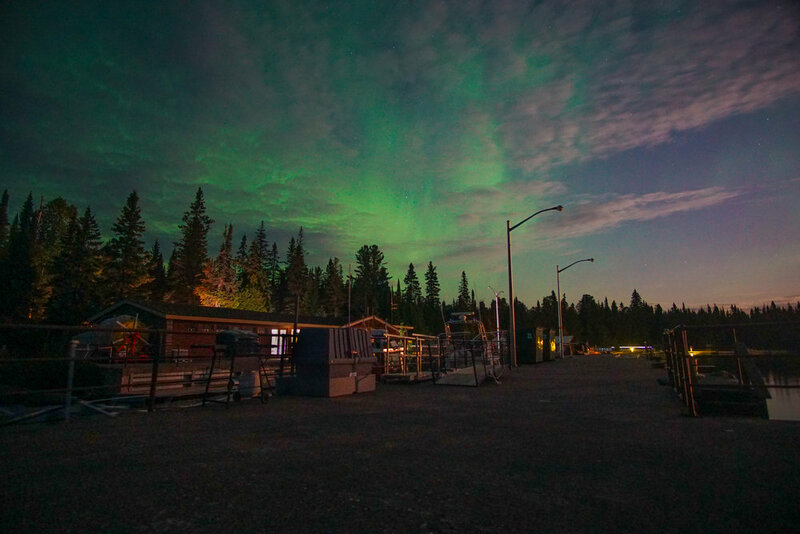 It didn't take long for us to realize it was the northern lights coming out as those "clouds" started to streak and come alive, to which we promptly started freaking out with unadulterated joy. Seeing the northern lights was one of our biggest goals being that far north and mother nature was coming through for us in the clutch. I quickly snapped two photos with my camera, using Colin's back as a manopod, before sprinting back to grab Chris and my tripod. Back in the harbor with my tripod and Chris, the whole group was together sitting on the dock and watching with wide eyes as the northern lights streamed and cycled like waves through the sky. I set up my tripod and took as many photos as I could, playing around with the settings to try and get the best combination of lighting between the bright rising moon due east, the dock lights to the northeast, and the mainly green hue of light coming over the trees from the north. For the most part, the camera captures the color better than the naked eye. But occasionally there would be these incredible, illuminating bursts of purple and green that only the eyes could consume, while diligently staring into the sky. And to me, it seems that no camera can appropriately capture the essence of the northern lights as they come alive and move in ways that seem magical. The next morning we packed up our tents and went to the restaurant for breakfast. We asked for cinnamon rolls but were told they didn't have any (for us), learning later they were specially meant for guests of the resort. So when we saw them bring out cinnamon rolls to another table I couldn't control my audible gasp of "look they're getting cinnamon rolls!" Apparently our waitress heard that and suddenly we found two cinnamon rolls being generously placed at our table - I guess it does help to sometimes make a scene? I didn't know whether to feel guilty until I took a bite and all my concerns on that topic went away. After breakfast we went on the Scoville Point/Stoll Trail loop that passes over a few different "climates" and mines on Isle Royale, all while having different signs that talk about the history of the island and its unique biosphere. After a week of hiking with heavy packs, it felt amazing to hike in sandals without any extra weight. After the hike we collected our things, sat down for some lunch at the docks, and waited for the ferry that would take us back to Copper Harbor/reality. Waiting for the boat, I took some time to reflect and journal about the trip and also look at all the northern lights photos. They may not have been the brightest, most glamorous northern lights you could ever see. They didn't have the robust set of multiple colors you often see in people's photos, and the moon was so bright that it eventually drowned them out. But sitting peacefully on the dock that night with my friends, kicking off my year of travel around national parks, proudly celebrating a week of exploration in my home state, and checking off a bucket list item of such raw and natural beauty, I realized the trip and that special moment under the night sky was perfectly bright and wanting of nothing.